I have problems when it comes to food. But the good thing is that I am working on them, and finding solutions one thing at the time; this time it comes in a form of fiber and a box of cereal. Let me be straight up and honest with you and tell how Kellogg cereal is helping me to live life to the fullest and to be healthier me. I’ve always been very bad about finding balance with food, and healthy eating. When I was still in school, I lead a very busy lifestyle, I was in competitive sports, and worked as a model. I was under 110 lbs but was told I was too big; I had too much muscle, especially in my legs, thanks to ballroom dancing. The combination of being too busy to eat and being told constantly that I was too big lead me to get anorexia. I thought the cure for that would be easy; I will just start eating. The same way as the right solution to lose weight isn’t to just stop eating the right solution to gain weight isn’t to start eating. It’s not that simple. For 6 years I tried, but not finding a balance, and this lead me to get hypoglycemia ; and sugar-highs started being a part of my life. A year later I got pregnant, and I felt that I really had to step up on my game to keep the baby alive. The years I was pregnant and then nursing the babies (I had three in three years!) I took care of myself for the babies. I ate right and right foods. Then the kids got older, and I don’t know what happened, I just stopped taking care of myself, and I have gained around 25 lbs in the past 5 years. My biggest pet peeve is skipping meals, and then eating a huge dinner. I’ve had excuses like I don’t have time to eat. Last year I worked full time from home plus ran my blog network plus wrote for Lifetime Moms, and I ate breakfast and lunch maybe twice a month if that. I don’t even know how much I gained weight last year alone by NOT eating during the day, just drinking coffee all day long, and then eating way too much for dinner. Now I have found one solution. Even on the busiest days, I try to have a bowl a cereal (often with blueberries) on the morning, and if I don’t have time to make lunch, I try to remember to eat another bowl of cereal for lunch. It’s fast and easy – and good for me! And can you believe it – I have started eating and I have actually lost weight? And to feel better. And to have more energy. And I don’t have to eat a huge dinner anymore. The trick to healthy weight management and feeling better is eating smaller meals more often. I have been buying a lot of different kinds of cereals the past six months and when I saw the Kellogg’s FiberPlus cereals on the store shelf, the fiber content immediately got my attention. Kellogg’s FiberPlus Berry Yogurt Crunch cereal has 25 grams of whole grains per serving, and it provides 40% of the recommended daily amount of fiber by American Heart Association. Fiber reduces the risk of type 2 diabetes and helps to reduce blood cholesterol and can lower your risk of cardiovascular disease, as well as promotes a healthy digestive system. Fiber can also help you to feel fuller, and I don’t have that hunger on the evenings anymore and I can eat a small or moderate dinner when I have had my FiberPlus cereal during the day. 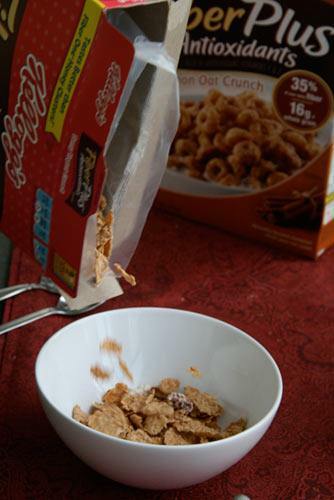 Kellogg FiberPlus cereal comes in two great flavors; Berry Yogurt Crunch and Cinnamon Oat Crunch. My favorite is the Berry Yogurt, it’s much sweeter than some of the other healthy high fiber cereals out there – you know, the ones that taste like cardboard – but it’s still not too sweet like most of the kid’s cereals are to my taste. I like the crunch and I love adding fresh blueberries to the Berry Yogurt Crunch cereal. I had been buying the Kellogg FiberPlus Berry Yogurt Crunch already when I was asked to review the Kellogg FiberPlus cereals, but I had not tried the Kellogg FiberPlus Cinnamon Oat Crunch before. It’s like better tasking Cheerios with cinnamon and it is better cereal for you because it has 3 times more fiber than Honey Nut Cheerios! I still like the Berry Yogurt Crunch better, but as a mom I’m happy that my kids love the Cinnamon Oat Crunch because now we have switched from Cheerios to them. Give these two cereals a try! Step by step I am moving towards healthier me. What have you done for your health lately? Disclosure: This post was compensated and I received a product sample, but all of my opinions are my own and I have been using the product even before I was asked to write about it. Good point. I love fiber cereals. Should remember to eat them regularly, too. Juhannusterkut! We all have our issues when it comes to living a healthier lifestyle. It’s nice to know that there are products like this one and tips for helping us take care of ourselves. Thanks for the tip! I’m going to pick some of this up on my next grocery trip!